Their greatest weapon is fear. Yours is an assault rifle. Execute Omega Protocol. You think that every possibility had been mined in the dungeoncrawl genre; that there couldn’t possibly be another game that adds something new. 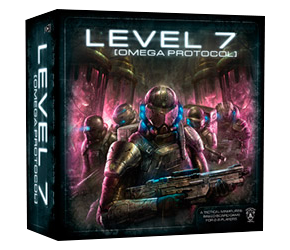 Then along comes Level 7 (Omega Protocol), which adds one clever little mechanic that breathes new life into moving little plastic guys around illustrated tiles. Yep, it’s all about ‘adrenaline’, the currency that fuels the actions of both commandos and aliens in this tactical miniatures board game by Privateer Press (makers of Warmachine and Hordes). The commando players accumulate adrenaline tokens to perform their actions, but at the start of the commando turn they must pass them all over to the alien player, who spends them to perform his actions. This ingenious push-and-pull invests every decision for the commando players with meaning, as the more actions they perform, the more actions their enemy can perform in retaliation. The rest is pretty standard dungeoncrawl fare: a set of linked scenarios, some traps, a simple combat system: but the adrenaline mechanic is enough to make this game my new favourite in the genre. Would love to see and insert design for this. I’m sure it would be better than what I slapped together. Fantastic! I’d love to see those miniatures painted. Your tutorials are great!